Natural and beautiful finish is made possible by Dr. Tsutsui's unique theory and technique. His treatment policy is to minimize patients' discomfort while achieving maximum results. A tailor-made treatment plan is presented to each patient. To ensure utmost patient satisfaction, detailed dimensional alignments are made before the final finish is given. 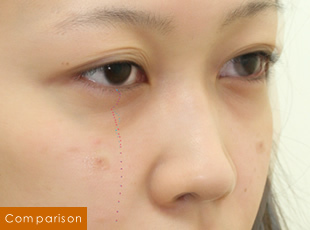 Doctor's fat injection technique determines the outcome of degreasing (Transconjunctival Blepharoplasty) and lipo transfer treatment. 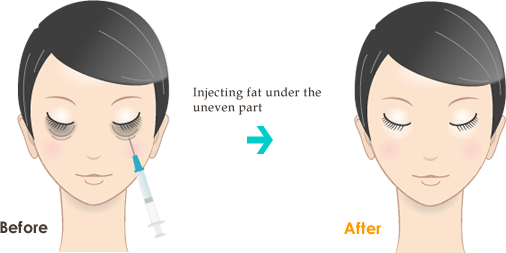 Since the amount of fat injected into the skin is adjusted by 0.01ml, even a slight swelling makes it difficult to decide the right amount of fat injected. Lesser swelling means less damage to the skin and it also shortens the recovery time after treatment. The graft survival rate is strongly related to swelling. Whether injected fat survives or not depends on how fast the blood circulation is restored. Severe swelling causes unnecessary fluid and blood to pool around the injected fat. This inhibits the restoration of blood circulation and lowers the graft survival rate. The same thing happens during the injection of concentrated stem cells. There's nothing good about swelling. Minimizing swelling maximizes the benefits that patients can receive from the treatment. This is why Theory Clinic strives to make every possible effort to prevent swelling. The degree of swelling largely depends on the degree of bleeding that occurs during the treatment.Degreasing is to remove the fat around the eye orbit that contains a number of blood vessels. A bloodless surgery requires high level of skill including proper handling of blood vessels. Theory Clinic uses the needles that are specifically designed for fat injection and that go through the fat cells without pressure. The needles are so thin that they cause only a little damage of the subcutaneous tissues under the skin of the cheek. Their round tips enable the injection of fat without damaging blood vessels and minimize unnecessary bleeding under the skin. Due to the presence of all these features in the special needles, fat can be injected without swelling and high graft survival rate can be achieved. In general, many clinics inject fat from two to three spots on the cheek and the under-eye area. However, this often causes bleeding and swelling under the skin, especially around the areas that are rich in blood vessels such as the orbicular muscle. At Theory Clinic, injection spot is limited to one at the central part of each cheek. This enables the injection of fat to the whole under eye area while preventing unwanted bleeding. The skin under the eyes is sensitive and swells easily. Using a lot of anesthesia in this area promotes swelling. At Theory Clinic, minimum amount of topical anesthesia is applied only to the pain spots for the maximum numbing effect. Patients often get tugging pains around the orbital fat pad. Unlike many other clinics, where a large amount of anesthesia is injected into the fat pad to prevent pain, we inject minimum anesthesia by using a special needle that directly and safely penetrates deeper and into the fat pad. This ensures no pain and no swelling. 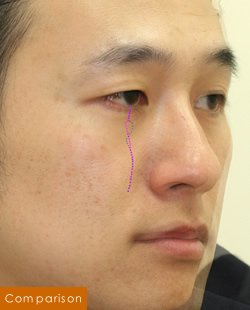 To remove the herniated orbital fat, Theory Clinic uses conjunctival incision method. In this surgery, conjunctiva (a thin film covering the surface of the eyeball and sclera) needs to be cut open. Since this part has many blood vessels, we use a diathermy knife to cut only about 4mm of it to prevent bleeding. How do you avoid swelling? It has long been thought that swelling is a natural side effect of eye bags removal treatment. Even today, many clinics keep treating eye bag problems without making enough efforts to prevent or reduce swelling. Since swelling is caused by either bleeding or damage done to the tissues during treatment, it is possible to minimize swelling by controlling the amount of bleeding and applying a method to reduce tissue damage by using tools that are developed with cutting-edge technology. 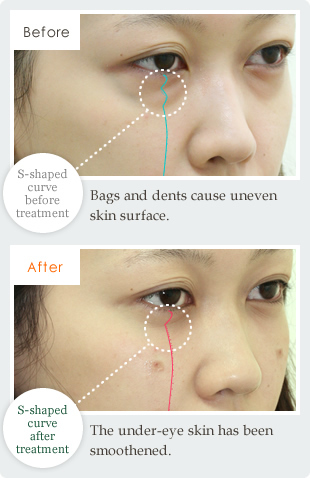 When treating eye bags, Theory Clinic pays particularly close attention to the S-shaped curves under the eyes from the eye bags to the cheek (see the red dotted line in the right image). Improving this uneven skin surface under the eyes is the most important part of the eye bags treatment. Degreasing only improves puffiness, but it does not eliminate dents. Therefore, we use both degreasing and lipo transfer during treatment. Medical studies have confirmed that two kinds of fat, orbital fat pad and cheek fat move down and cause uneven skin under the eyes. With age, the orbital fat pad gradually moves down and forward from the eyeball area. Usually, orbital septum along with ligaments and orbicularis oculi muscles inhibits the fat pad from descending; however, aging weakens their holding power. When we are young, our cheek fat is firmly fixed on the cheek with muscles. As we get old, because of the weakening of the muscles, the cheek fat gradually starts to descend, causing dents under the eye area particularly on the lower border of the orbits. This is how S-shaped curves are formed. It is absolutely necessary to straighten the curves in order to achieve successful removal of the eye bags. Due to aging and gravity, the orbital fat pad moves down to the under-eye area and inflates it, causing eye bags and shadows.Degreasing removes the inflated orbital fat pad and smoothes the under-eye area. At Theory Clinic, degreasing is done with least possible bleeding and swelling. Degreasing alone cannot flatten S-shaped curves. To give each patient the best S-shaped curves, we carefully examine and treat the curves by using both degreasing and lipo transfer. 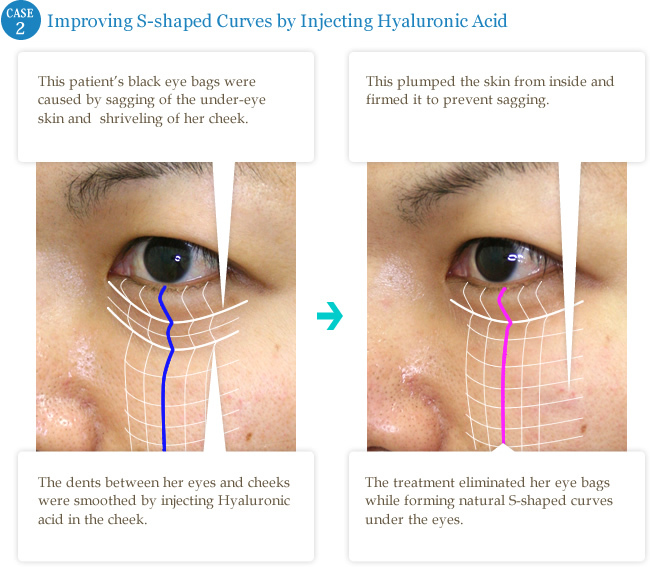 When necessary, we inject fat or Hyaluronic acid to correct the dents under the eyes and adjust the S-shaped curves. Different patients have different symptoms. Degreasing corrects the fat pad inflation; however, it tends to create an unnatural look and is not always an ultimate solution to eye bag problems. Theory Clinic provides a tailor-made plan to each patient for treating the under-eye area so as to give a natural looking finish. Degreasing is a method that reduces the inflated orbital fat pad under the eyes. Theory Clinic's “Degreasing plus Lipo Transfer” treatment not only reduces the fat pad inflation but also smoothes undesirable bumpy S-shaped curves. Degreasing can correct the S-shape curves to a certain degree; however, in most cases, it is hard to obtain a satisfactory result. A key to success in the S-shaped curve alignment is to remove “the right amount” of the orbital fat pad. Too much removal causes dents and too little removal leaves puffs. The amount of fat that should be removed differs substantially among individuals. It is hard to judge “the right amount” by looks and it is almost impossible to determine it while a patient is lying on an operating table. This is why we, at Theory Clinic, use degreasing and lipo transfer in combination to align the S-shaped curves. The skin around the eyes changes its form with facial expressions that are motions of the muscles underneath the skin. Theory Clinic's four dimensional designing is a finishing method that is focused on the change of expressions. If we are working on a motionless object such as a sculpture, three dimensional designing is enough to create expressions. However, it is essential to use the four dimensional designing technique to give a human face, beautiful and natural look. We adjust the S-shaped curves by injecting fat (lipo transfer) while the patient sits up and makes various facial expressions. The four dimensional designing begins with a counseling session while the patient makes various facial expressions. To create the best treatment plan, we carefully observe how patient's eye bags and shadows change as their facial expressions change. 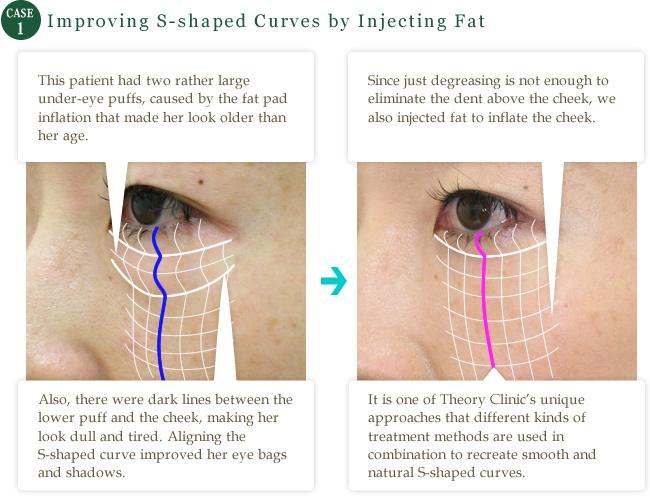 We adjust the S-shaped curves meticulously by “degreasing and lipo transfer” while the patient looks up and down. This approach enables us to remove the eye bags perfectly and to give the patient a natural look. In fine-tuning, it is important to remove “the right amount” of orbital fat pad. Too much removal causes dents and too little removal leaves puffs. The amount of fat that should be removed differs substantially among individuals. It is hard to judge “the right amount” by looks and it is almost impossible to determine it while a patient is lying on an operating table. This is why we treat our patients while they sit up. For fat injection, do you use fat taken from the thigh or the abdominal area? After degreasing, injecting fat collected from other parts of the body or injecting CRF (condensed rich fat) is a common practice at many other clinics. 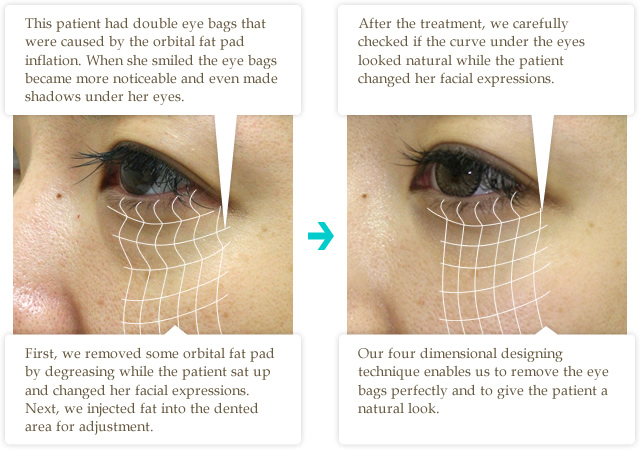 At Theory Clinic, only 20% of the patients need more than the orbital fat pad collected from the under eye area. In our “degreasing and lipo transfer” treatment, we inject the collected fat pad from the under-eye area to adjust the S-shaped curves. Only if a patient has large dents and needs a lot of fat to fill them, we collect as little as 10cc of fat from the thigh or the abdominal area. We do not use CRF for the following reasons: although the fat quality is high, about 50cc of fat needs to be collected from other body parts to create CRF, which causes a lot of strain on the patient's body. Also, CRF's survival rate after injection is only about 10% higher than that of the orbital fat pad. Furthermore, it is very expensive yet there is no guarantee that enough CRF that is required for the treatment can be created from the collected fat. ･ A large amount of fat needs to be collected from a patient's body to create CRF. ･ Only 20% of our patients need more than the collected orbital fat pad. ･ There is no guarantee that the created CRF is sufficient for the treatment. 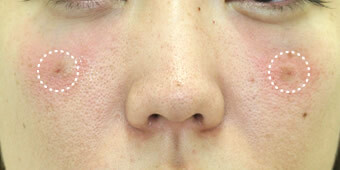 ･ The survival rate of the injected fat pad is high around the under-eye area. ･ In case, the injected orbital fat pad does not survive sufficiently, we redo the injection at a small cost. However, since only 2% of such patients decide to receive another fat injection, we think that using expensive CRF injection has little benefit.